Kamera Betrug: Sophia Taylor und ihre Nikon D2X für 480 Euro. Sophia Taylor und ihre Nikon D2X für 480 Euro. 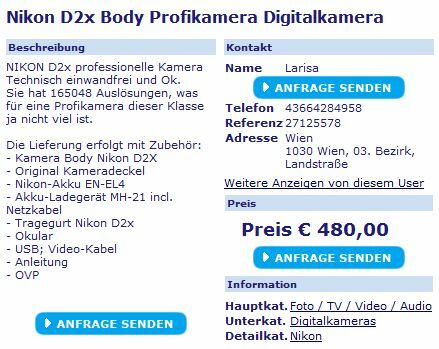 Kurz und knapp warnen wir vor einer gewissen Sophia Taylor ( sophia9t@hotmail.com ), die als Larisa eine Nikon D2X für nur 480 EUR anbietet. Es ist fast immer die gleiche Masche: In den Kontaktdaten taucht nur ein Vorname auf, der jedoch keine Verbindung zur tatsächlichen E-Mail-Adresse aufweist. Dies sollte potentielle Interessenten misstrauisch stimmen. Vielen Dank für das Zusenden der Infos, Kevin! I'm really glad you are interested in my product. It used to belong to my husband , he gave it to me after the divorce and I have no use for it. I just want to get rid of it as soon as possible because i need the money in this days.I am a single mom with 2 small children so I think you can imagine that it's quite difficult. I'm not really good at this stuff all I know is that it's working perfectly and never had problems.Never been damaged,dropped and has no dents or scratches. After the divorce I moved back to my mother in Milano along with all my belongings .I cannot sell it in Italy because the specifications are different , and nobody wants to buy a product made in another country. I'll ship it using an international service at no charge for you. The listed price is the real price. Because I can't explain much about the item technical stuff I'll offer a 5 day's return option. If you are serious about buying it, email me back so that I can explain how this will work.